New Trends in Recruitment & Talent Acquisition | Business Article | MBA Skool-Study.Learn.Share. Old School Inc. had never had problems in acquiring talent. They were an old and reputed company who had enjoyed a good name in the employment market for umpteen years. Year on year, they went on offering similar facilities to employees and the candidates were happy with what was on the table. However, two years back the recruitment head got surprised when three of the five campuses they visited gave low to moderate responses to the recruitment drive. When this repeated the next year, he got discussing this with his colleagues at other places who reported of similar problems over the past few years not just from campuses but even from the market. He realized that it was a paradigm shift, a change in the concepts of Talent Acquisition from a ‘Buyer’s Market’ to a ‘Seller’s Market’. This year he goes to campuses again in a few months, but this time he wants to be prepared. More and more firms each day are realizing that it is getting harder to source talent. Is the problem causing new trends to rise or are the new trends causing the problems for those who fail to keep up?-That is a different question for another discussion. 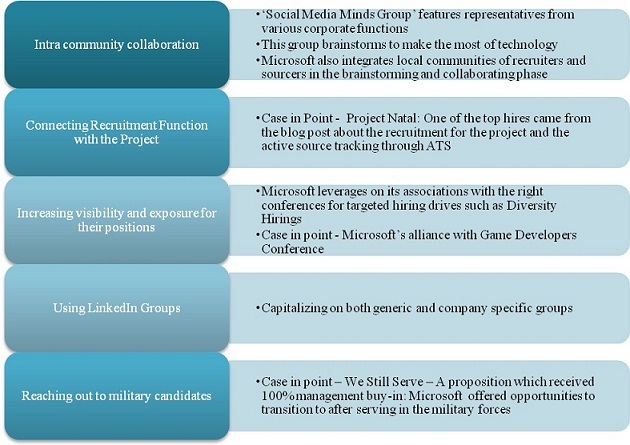 Discussed below are a few of the talent acquisition trends visible in the market today. Social Media – The Social Media has been gaining popularity as a hub that houses a significantly high proportion of passive prospects, the resources most organizations vie for in the present times. The nuances that differentiate the social media from the regular career sites are integrating the engagement angle with the regular job broadcast. By joining the employer community, an aspirant not only learns about the job on offer but also gets a step closer to the culture of his/her prospective employer. Boomerang Rehires – Corporate boomerang/alumni rehire program is a low-cost, high ROI recruiting approach. Often underused, it is a best practice that professional service firms like McKinsey and Booz Allen Hamilton have used for years to leverage a talent population that is familiar with their organizational culture and that has a proven ability to perform. With increasing problems of culture alignment and on-boarding, companies are taking up initiatives to attract back the people who had left them. Instead of an informal call or using contacts, companies are putting in place a formal the process and taking steps to not let the rehire feel second in any scenario. Shift from active tools - Passive job seekers are those who are satisfied with their current designation in their present organization. Usually, they are highly engaged and motivated and not seeking a change-rarely visible on job portals. These self motivated people are too satisfied or successful to even consider shift but are a decent percentage of the best talent in the industry and hence are the becoming more attractive to the hirers. According to reports published by Zinnov Management Consultants: for any MNC product company, the mobile talent poll at any point of time is approximately 18% of which 12% are active job seekers and 6% are passive jobseekers. The obvious problem is to try and reach them and this is where increased networking and specialized consultants come in. An astounding 83% of the people on LinkedIn who already have jobs think of themselves as passive candidates for new openings at other organizations. Capgemini is known to have started using LinkedIn and Facebook for getting in touch with passive seekers. Mobile Technology- Mobile is transforming how organizations operate, offering more connectivity, opportunities, and partnerships. According to a study by ComScore, the number of smart phone users at the end of 2010 was 60% higher than a year ago. In order for talent acquisition to stay relevant, mobile needs to be a part of the equation. Despite a large number of mobile “job apps” and talent acquisition system providers launching “mobile solutions”, very few providers offer native applications for both recruiters and job candidates. Even fewer providers offer a dedicated team to take on this endeavor. Kenexa launched its mobile solution this year. ADP and Taleo will follow suit later in the year. This is indeed a rising trend and is here to stay. 360 degree approach in Talent Acquisition- Google received accolades for fostering a culture of excellence driven by empowerment. The multinational prides itself on the resources it hires. Google believes in hiring resources who can not only generate ideas for the future but who can also help mentor colleagues in the pursuit of organizational goals. “Bosses work closely with you and you are never penalized for your failures”, says a fresh recruit who believes Google offers a holistically different working environment. Internal Promotion: Say the industry average paid to a senior engineer is about 5 lacs per annum, but if you hire one from the market you end up paying 6, stressing your salary bill. This is indeed a major problem for the services sector where the salary bill might go over 60%. Thus, more and more companies are encouraging internal promotion, rarely hiring from the outside. GE lays extra stress on developing talent internally and preparing them for middle and senior management roles by running extensive management development programs right after the appraisal cycle. Employer Branding- More than ever before companies are engaged in branding themselves for talent. They undertake CSR activities, organize Campus programs, hire Campus connects, hold competitions to ensure that they make the population like them as employers. The new trend sees Employer branding teams in organizations and fully fledged projects being taken up by interns. Even top employer branding companies like Google, Adidas, and Deloitte are constantly seeking innovative ways to source, develop, and retain talent. If that’s what is happening with the market leaders, consider the millions of other companies around the world who have similar challenges. Assessment Centres- Research shows that the normal 10 minute interview which forms the basis of most of the hiring processes is one of the most inefficient ways to assess people. However it is the cheapest and the fastest. But, as talent becomes costlier and more difficult to source, companies are beginning to go the extra mile to ensure it fits their requirement. P&G and HCCB are among a few companies who have had assessment centres for some time and many more are following suit. Maintaining parity- An acquaintance from a good business school who was trying to shift jobs was told that he would be given the average raise which was given to all pass-outs of that particular year from that particular b-school tier. This is an upcoming trend where companies are trying to bring in ‘batch parity’ to hold the inflating salary bill. Mostly companies with a good image in the market can manage to do so as they advertise that people should join them not for the raise but for the better learning. Satellite Location Hiring- The major IT companies in Kolkata were having problems in hiring. The talent pool was limited and they had to go through the same candidates again and again. So, what IBM decided was to start hiring from satellite towns which were far enough to ensure that the people were fresh but were close enough to avoid relocation problems. This is becoming a new trend for major cities, for example companies in Delhi have started visiting nearby cities like Ghaziabad for talent. Diversity Hiring- Some like Deutsche Bank have been sensitized towards the importance of diversity in the workforce and are known to pay an extra 2% to the consultants to source such candidates; the others are catching up and at a fast rate. It should be noted that diversity is not restricted to gender. Maintaining diversity is one of the major trends of talent acquisition, not just because it helps organizations to have better workforce dynamics but also clients have started asking for teams with diversity. Increasing focus on Employee Referrals – Consultants are costly, cold calling takes time and half the new joiners don’t turn up the first day. Companies today are laying great impetus on employee referrals as they are cheap, people quickly want to join and a majority of them actually join. For example, Saint Gobain, if deciding to hire externally, opens up the vacancy for referrals internally before scouting out. This gives the employees a chance to not just earn the extra cash, but also makes them feel involved. Pre induction engagement practices: Organizations like Godrej are growing wary of the criticality of the time period between the candidate getting an offer and the time of joining the company. This time; organizations believe can be capitalized to arrest the probability of offer declines. Companies have gone on to extend the scope of employee engagement principle to include pre-employment engagement. These attempts serve a dual purpose: they help build lasting relationships with prospective joiners and also help build the brand for prospective candidates. Godrej Properties Ltd. is a case in point. The company has been planning to get the selected candidates to be acquainted with the company culture through efforts like sending personalized hampers, containing books and music suiting the tastes of the candidates. These are complemented with lunch or dinner with senior management and the HR Forum. Remote functioning :Cisco Retention helping in Talent Acquisition:More than a half of the population employed in the services sector are ‘information workers’ – the ones who hardly need anything more than a network connection and a phone to be well equipped for the job. The practice of remote functioning has its foundation in the philosophy that allowing top talent the luxury of working from wherever they prefer to improve retention and makes the job of talent acquisition a lot easier. Cisco Systems has a high degree of reliance on collaboration technology to capitalize on the growing demand for remote functioning. This trend which was initially assumed to grow popular for only large organizations, finds application in organizations with varied scales of operation. As Franklin D. Roosevelt said: “With power comes great responsibility”; the power we are exercising to change the old ways bring in new dangers. For example: with Social Media there is the possibility of forming biased judgements based on the plethora of personal information available; while trying to maintain diversity, we may abuse the process and end up segregating the workforce; and rehires may unduly enjoy or suffer from ‘Halo’ and ‘Horn’ effects respectively. Clichéd as it may sound, but Talent acquisition has transformed from being an exercise to an experience for the candidate. The candidate maybe selected or not, but he should not go back thinking that he did not get a fair chance, that the process was based on the whims or fancies of someone-he should go back as a delighted customer. Ergo, the new trends should be about improving the candidate experience: Recruitment has transcended beyond the boundaries of a function to an experience. Job sites have given way to career networks. This article has been authored by Ronald Browne & Sushmita Barua from SIBM Pune.